The best tip voor the most beautiful sunset at Ibiza! You will find lot’s of beautiful places to watch the sunset at Ibiza. 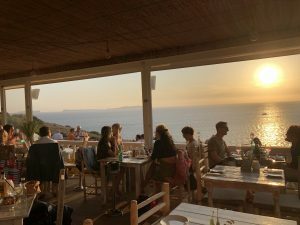 Cafe Del Mar is one of the best known sunset spots at the island to watch the sunset together with a lot of other people and a lovely drink. But I know another sunset hotspot which is one of my favorites. Less crowded than Cafe del Mar, but more people are exploring this place as well by now. My tip for one of the most beautiful sunsets is to go to La Torre, just above San Antonio. (San Antonio Cap Negret) It’s a lovely spot, where you are able to relax and you can enjoy a beautiful sunset. 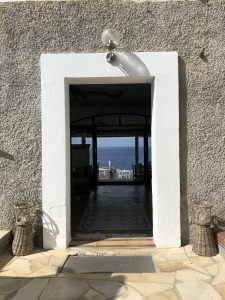 Hostal La Torre is as it’s name say’s a hostal with a restaurant at the sea, where you are able to enjoy a beautiful sunset. Take a drink at their terrace or enjoy your dinner at sunset. Together with some nice chill out beats played by a DJ, because that is Ibiza as well of course, you will have a lovely evening. It’s well known, so make your reservation in advance. A nice thing is they put some seats at the mass of rocks that goes from the restaurant down to sea, where you can enjoy the beautiful view as well. 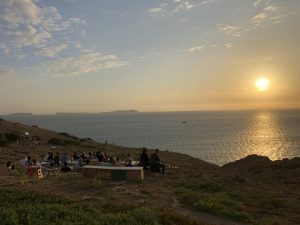 They put chill pillows on the seats so you can sit down together with your partner or friends in a relaxt way and enjoy your sunset evening together. I can tell you that they serve a good breakfast at La Torre as well. Because besides a beautiful sunset, what is more lovely than start your day with breakfast and sea view? Do you want to know more spots for beautiful sunsets?